The new Expert Logger 400 from Delphin combines the latest communication capability with advanced measurement technology. Designed to fulfill many applications including data logging, product test, lab data acquisition, process monitoring and more, this compact system offers simple operation. The new 400 model can process up to 16 universal analog input channels at high sampling rates up to 1000 Hz. Now measurement data can be accurately acquired, independently stored, and transmitted to the Internet or a PC for evaluation via USB, LAN, WLAN or LTE. CAS DataLoggers offers Delphin products in the USA—call our Applications Specialists today at (800) 956-4437! The Delphin Expert Logger 400 is equipped with an internal 4GB memory that can independently store up to 30 million measurement values, date- and time-stamped to millisecond precision. Storage capacity can be extended as required via external USB or LAN storage devices (NAS). An integrated, energy-saving “sleep function” automatically switches off the device during breaks in measurement acquisition. The Expert Logger operates with standard batteries, rechargeable batteries, or solar units. Precision measurement is ensured through the use of a 24-bit converter. All channels are galvanically isolated, and the device operates noise- and maintenance-free. With Expert Logger models, sensors are connected via plug-in screw terminals with a chart showing how channels are arranged. Each set of four terminals can be configured as two differential inputs to measure Voltage, Currents, Thermocouples, or to take measurements from a 4-wire RTD. 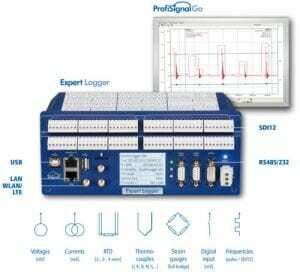 The Expert Logger is easy to configure from a PC. These settings remain stored within the Expert Logger even when disconnected from the power supply. Device settings can also be read out and stored on a PC and analyzed offline without the need for a connected Expert Logger. Signal processing using internal software channels greatly simplifies measurement tasks. The Delphin system’s flexible calculation channels enable measurement data to undergo further computation and recording. Integrators directly calculate volumes or quantities from time-related measurement data such as mass and discharge flow rates. Meanwhile the Expert Logger‘s software channels clearly set it apart from other loggers and make it very popular among users.